Rose Geranium plant, Pelargonium graveolens, is a sweet smelling ornamental plant that graces many gardens, grown for the scent of the leaves rather than the flowers. Traditional African folk use of the leaves as a remedy for dysentery, haemorrhoids and inflammations. Modern use of the leaf and oil include treatment of acne, bruises, eczema and lice. The essential oil made from the leaf and flower is used in aromatherapy to lower blood pressure. Jelly is sometimes prepared using the leaf. A herbal tea is also made from the leaf. 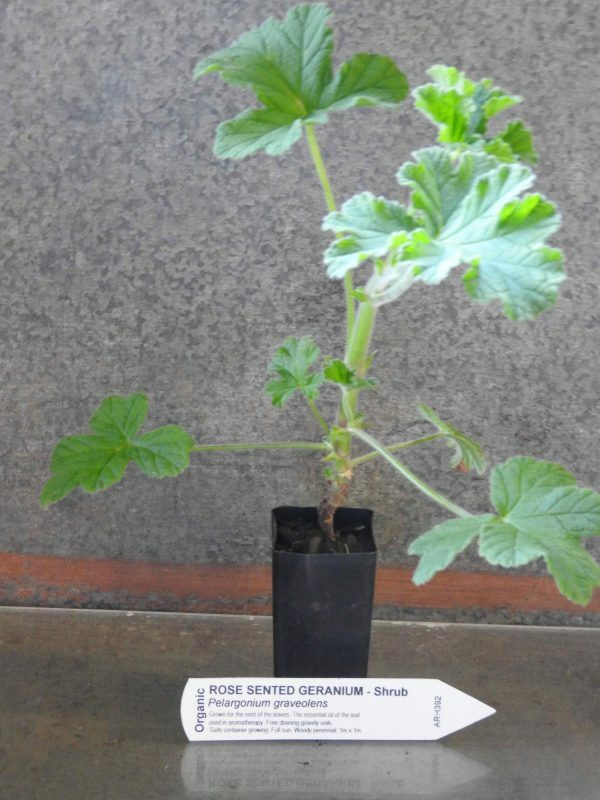 Rose Geranium plant is native to South Africa and prefers humus rich, free draining gravely soils. May be grown in a container. Plant in an open, sunny position. Drought and frost resistant. A woody perennial. growing to 1m x 1m. Be the first to review “Geranium, Rose Scented plant” Click here to cancel reply.